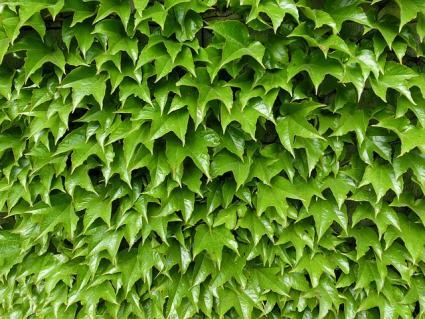 English ivy (Hedera helix) is one of the toughest plants for shady conditions. Hardy in USDA zones 5 through 11, it thrives with little care in the deepest of shade. However, its adaptability can also be a curse - few plants spread as aggressively as English ivy, giving it a reputation as an invasive species throughout its range. 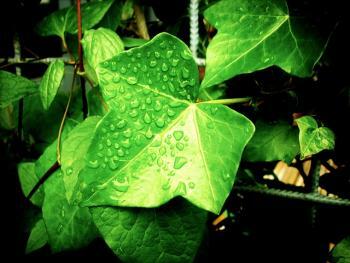 English ivy, sometimes known as common ivy, is a woody evergreen plant with deep green three- or five-pointed leaves that can be anywhere from one to six inches across depending in the variety. It rarely flowers, but occasionally produces inconspicuous white blossoms that are followed by pea-size blue-black berries. It grows lushly in moist, rich soil, but will tolerate dry, rock-hard conditions if it is given a little water to get established. It prefers partial to full shade, but can tolerate a few hours of sun each day, as long as it is not in the hottest hours of the afternoon. 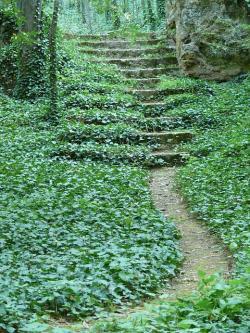 Ivy grows as a foot-tall groundcover, quickly covering large areas. Wherever it encounters a vertical object - whether a tree, trellis, or the side of the house - it becomes vine-like and quickly climbs skyward, reaching a height of 50 feet or more. Ivy can be used for its vining habit or as a groundcover. Plant it in shady areas with poor soil where little else will grow. If planting it around other plants, whether small species or enormous trees, beware that diligent maintenance will be necessary to keep it from overtaking nearby plants. 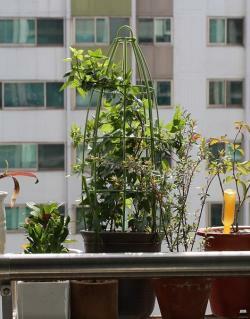 The same goes when planting it near a structure. It is traditionally used on brick, stucco, stone, and concrete walls, but if allowed to climb to the eaves, the tendrils can get between pieces of wood and pry them apart. It will destroy any type of wood or composite siding. The best way to plant ivy is to confine it within an area that is surrounded by paving on all sides, such as between a driveway and a patio. If it has no boundary it will grow indefinitely, creating a never-ending chore to contain it. A pot or planter provides another means of containing ivy. This can range form enormous urns and tree planters to tiny four-inch pots used as decoration, both indoors and out. For smaller pots, use one of the dwarf cultivars. Ivy is best planted in the cool weather of fall or spring, but can be planted in summer if irrigation is provided, or in winter if the ground is not frozen. For groundcover purposes use small plugs planted one to two feet apart. A small plug is also fine for a single specimen as it will grow more than head high within a couple years. Ivy will only grow faster if the soil is loosened and amended with compost though the effort is hardly necessary. 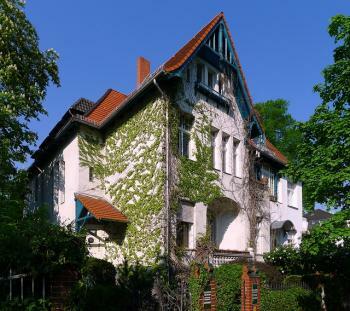 Ivy needs a bit of water to get established, but becomes quite drought tolerant over time. Only when it is planted in a pot (or planted in areas where it receives substantial sun) does ivy need irrigation on an ongoing basis. Fertilizer is not necessary for plants in the ground, but a monthly dose of a balanced all-purpose fertilizer is helpful to replace the nutrients leached out by irrigating potted specimens. 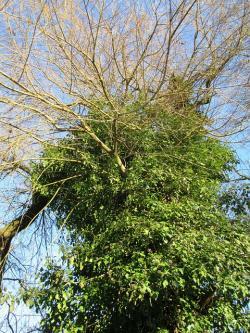 The primary maintenance with English ivy is to curb its growth. It can be trimmed back at any time of year and typically needs to be edged monthly to maintain a neat appearance. Ivy is prone to fungal and bacterial leaf spots, powdery mildew, aphids, spider mites and a handful of other pests and diseases, though these rarely cause more than a short-lived problem. Aphids and spider mites can be a repetitive issue with indoor potted plants, however. If they are, treat with an insecticidal soap or just periodically rinse off the insects under running water. One reason to think twice before planting English ivy is that it's extremely difficult to eradicate if it ends up somewhere that it is not wanted. If it climbs high into a tree, the vines are too massive to remove easily by hand. They must be cut at the base and allowed to wither and die, in which case they will eventually drop to the ground, but are an eyesore in the process. Cutting back ivy from where it is unwanted is a constant chore, but to completely eradicate it the roots must be dug out along with every bit of the vines, which root wherever they touch the ground and are capable of forming a new plant even after they are cut from the main root system. Digging out the roots with a mattock and shovel is typically the most effective method though it is extremely laborious if the vines cover a large area. Glyphosate and other herbicides are an effective control though the plants will grow back if they are not treated repeatedly. One option is to cut back the majority of top growth to find the larger root stumps, which can then be painted with herbicide to prevent them from re-sprouting. There are dozens of varieties available with various leaf shapes and colors. The dwarf variegated varieties are easily kept to two or three feet and are among the most popular for pots. All are hardy in USDA zones 5 to 11. 'Conglomerata' and 'Minima' are dwarf varieties with tiny leaves just one inch across. 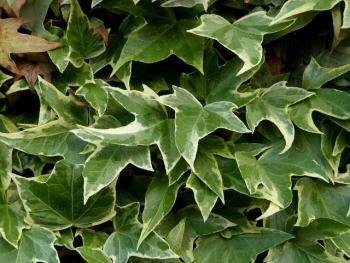 'Glacier' is a full size ivy bearing splotchy grey-green leaves with white margins. 'Deltoidea' is a full size ivy grown for its heart-shaped leaves. 'California' has curly leaves that create a ruffled appearance and does not spread as aggressively as other full size ivies. 'Gold Child' is a full size ivy with golden yellow margins on the leaves. Plant ivy with caution. In a pot it makes a charming, easy-care decoration for the living room or patio, but out in the landscape, it is only worthwhile in specific situations.